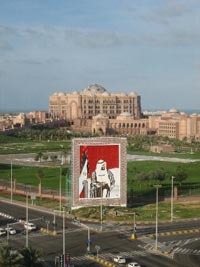 Emirates Palace in Abu Dhabi. 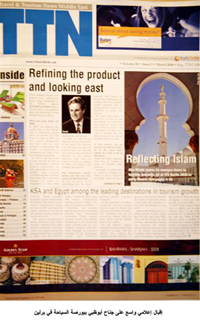 BERLIN (WAM)—A number of Arab Tourism Ministers, German tourist experts and officials of the World Tourism Organization, agreed that the tourism and property development projects in Abu Dhabi emirate, particularly Al Saadiyah Island development, will constitute a turning point in concept of tourism in the Middle East. They added that "the UAE is not only emerging as a regional tourism hub, but steadily growing as one of major tourist hubs worldwide." The remarks were made during the Arab-German Tourism Gathering on March 7, organized by the Arab-German Chamber of Commerce and Industry in Berlin, at the sideline of the International Travel Bourse, which was attended by Syrian Tourism Minister Dr Saddallh Agha and the Arab-German Chamber of Commerce Chairman Thomas Bach. "Gathering of world museums, such as Louvre and others in Abu Dhabi will change many concepts of tourism," Agha remarked. On his part, Bach said that he was closely following up amazing progress being witnessed by the UAE in general and Abu Dhabi in particular, adding that "the UAE is exerting significant efforts to develop tourism and seizes every opportunity to promote itself in EU market." Abu Dhabi has been selected as one of the top ten destinations in the world by expedia.co.uk, UK's largest online travel agent. 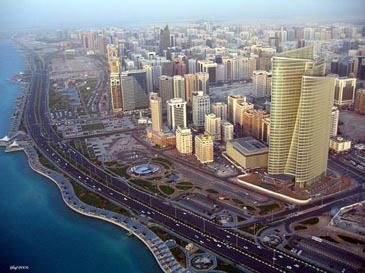 Abu Dhabi ranks among New Zealand, Argentina, China, Cape Verde, Alaska, Reykjavik, Berlin, Boston and Liverpool as one of the Top Ten places to visit in 2008. Explaining the choice of Abu Dhabi as a leading global destination, expedia.com wrote: "Few places can have undergone such fundamental change over the past 50 years as the emirate of Abu Dhabi. Today visitors can enjoy the beach, desert safarl's, variety enough to quench even the strongest thirst for retail therapy." His Excellency Sheikh Sultan Bin Tahnoun Al Nahyan, Chairman, Abu Dhabi Tourism Authority (ADTA), the apex body that manages Abu Dhabil's tourism sector, said: "The choice of Abu Dhabi in expedia.co.uk's Top 10 places to visit in 2008 is a reiteration of the growing stature earned by the emirate in the global tourism industry. Aerial view of Abu Dhabi. It also highlights the concerted efforts made by ADTA and stakeholders to showcase Abu Dhabi to global travelers and further develop the tourism luxurious offerings in the emirate through a carefully structured strategy, stressing on the influential role of the continuous programs managed and supervised by ADTA like road shows and Abu Dhabi Tourism Champion which had been launched in 2005 and covered major tour operators in basic cities in Europe." Talking of the emirate's unique luxury attractions, Mr. Mubarak Hamad Al Muhairi, Director General of ADTA, stated: "Abu Dhabi has an eclectic spread of choices that meets the demands of global travelers. Apart from famed sea, sun, sand and luxurious choices, which visitors to the UAE are assured of, Abu Dhabi also offers a unique cultural and heritage environment that fascinates visitors. Global travelers prefer to choose their holiday destination based on expedia.co.uk's recommendations. The selection of Abu Dhabi as a Top 10 place to visit is expected to fuel greater tourist interest from the West to the emirate. Dozens of Westerners, including black-clad women, have been flocking to Sheikh Zayed Mosque in Abu Dhabi, an architectural masterpiece graced with a Persian carpet said to be the biggest in the world. "It is the third biggest mosque in the world after the Haramain," boasted the project's deputy head, Khawla al-Suleimani, after Islam's two holiest sites in Saudi Arabia — Mecca's Grand Mosque and the Prophet's Mosque in Medina. Dozens of Westerners, including black-clad women, have been flocking to Sheikh Zayed Mosque in Abu Dhabi. But unlike these two mosques, the one named after the United Arab Emirates' late founding father, Sheikh Zayed bin Sultan al-Nahayan, is not off-limits to non-Muslims. In fact, the opposite is true, with some provisos. Women must cover themselves from head to toe in abayas, or long black robes, handed them at the entrance. "And non-Muslims must not touch the Koran," the Muslim holy book, copies of which are stacked in every prayer room, cautions one of the guides. Armed with cameras to capture the splendor of the place, visitors have been coming from within the UAE "but also from abroad," said Suleimani. "Hundreds have been coming every week since the opening (of the mosque) on the first day of Eid al-Adha," the Muslim feast of sacrifice which fell in December, she added. The project was launched in 1998 by Sheikh Zayed, who besides being the UAE's first president was also ruler of the oil-rich emirate of Abu Dhabi, one of seven making up the Gulf federation. Work will be fully completed in November 2009. Sheikh Zayed, who died in November 2004, is buried in a courtyard adjacent to the mosque. "The mosque is dedicated to the father of the nation, whose vision was founded on dialogue between religions, civilizations and cultures," say brochures handed out to visitors by the Abu Dhabi Tourism Authority. The authority began to organize guided tours of the place last month. "Apart from the thousands of (Muslim) faithful who come to pray, the mosque is visited by non-Muslims: Germans, French, Britons, Italians, Russians, Americans, Argentineans and Indians," it said in a guide. Unlike the leisure-oriented UAE emirate of Dubai, Abu Dhabi is seeking to become a cultural hub and sees the mosque as one more attraction for tourists looking for more than sandy beaches and huge shopping malls. "As Sheikh Zayed wished, the mosque was built on a 9.5-metre (31-feet) high hill so it is visible from far, it covers an area of 22,000 square meters (237,000 square feet), and it can accommodate more than 40,000 faithful," said engineer Mohammad Ali al-Ameri. Ameri said construction was nearly over, with only fences, gardens and car parks still to be completed. ""Thousands of workers," nearly all from the Asian subcontinent, were involved in building the mosque, he said. The sculptors were Moroccan. Thousands of rare and semi-precious stones, some encrusted in marble, were used to decorate the structure. The centerpiece is a 6,000 square meter (64,583 square feet) hand-made Persian carpet, said to be the biggest in the world. "More than 1,200 women from the Khorasan region in eastern Iran spent two years weaving the carpet, which weighs 45 tones and cost more than 8.5 million dollars," Ameri said. The carpet covers the floor of the main prayer hall, which can accommodate up to 9,000 faithful. Two rooms next to the main prayer hall, with a 1,500-capacity each, have been reserved for women, who can follow sermons delivered by prayer leaders on giant television screens. Islam requires men and women to pray separately. The main dome is also "the biggest" mosque dome in the world, according to Ameri, who said it is 75 meters (246 feet) high with a 32.2-metre (105.6 feet) diameter. Another breathtaking piece is a huge crystal chandelier in the main prayer hall, one of seven German-made chandeliers costing more than eight million dollars. It is 10-metre (32.8 feet) tall, 10-metre wide and weighs nine tones. Ameri would not give the total cost of the mosque, but Suleimani estimated it at more than two billion dirhams (545 million dollars).